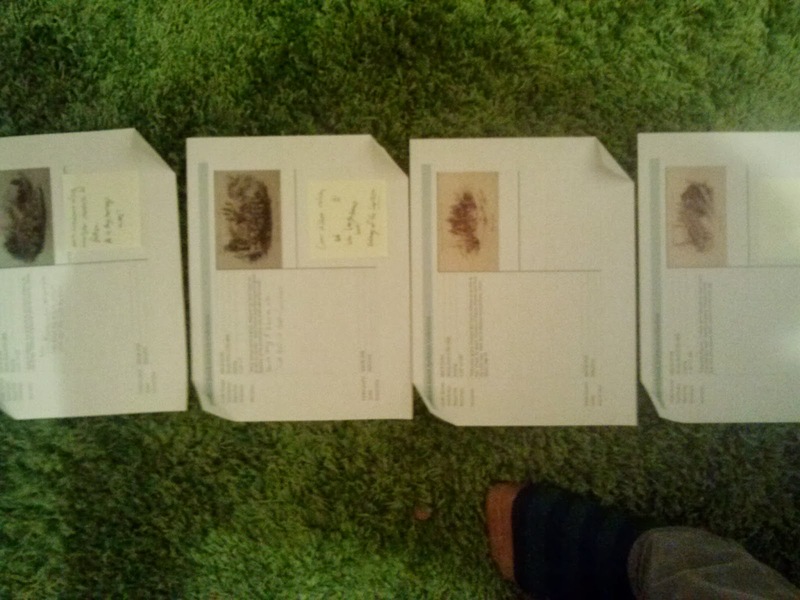 This week I completed the job I begun last week: organizing the drawings into groups of four for the exhibition next summer. Out of the hundred or so drawings, I organized eighty into columns of four each. The first three illustrate Point and his companions traveling to the Salish territory, including the changing landscape as well as the hardships of the long trip to the mountains. The second group each depict a different aspect village life. Hunting, familial and a handful of religious scenes show how Point and company adapted to Native American life and the early impact their presence had on the Salish and Coeur d'Alene Indians. I wanted these early columns to construct a narrative through imagery, beginning with Point's hardships and the rewards of his toils-conversions-becoming widespread in the area. Two mini-narratives of two major figures within the communities-Chief Nicholas of the Blackfoot and Ignace of the Flatheads-will show each man's religious life from baptism to death, and these eight pictures are my favorite in the entire collection. After these two columns, the subject matter shifts dramatically to war scenes. I wanted to emphasize the difficulty of life within this area, and after relatively lighthearted religious scenes I thought battles between sworn enemies offered the right tonal change. I began this section with drawings depicting battles between individuals, and slowly expanded the scope with each column. At the end of this section is a scene of many Flatheads battling scores of Blackfeet, with a depiction of Christ overlooking the converted Flatheads. I thought this picture combined the two major themes of the collection-that of frontier life and the impact of religion on Native Americans. As such, I wanted to present it in the foreground of the entire exhibition, as the culmination of the narrative begun in the journey pictures in column one. One drawing in the first column depicts a suffering Jesuit brother attempting to sleep next to a wagon on the long journey to the mountains. This large, mighty depiction of Christ overlooking the recent converts, in my opinion, answers the question thought by the audience: why would someone undertake this journey? The answer lay within this battle scene: to fulfill Christ's call to serve. The last several columns serve mostly as exposition for the artistic narrative featured below. This section features portraits more frequently than the previous. 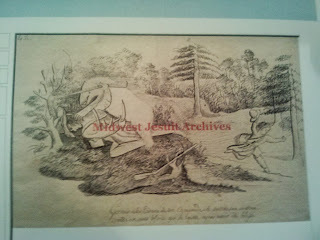 The reason behind this was to show the audience paintings of men who factored into the story of Point's mission in the frontier, fulfilling in their minds who these men were physically. The last piece, the one picture of the collection showing the Native American delegation to Washington, in my opinion depicts the lasting impact of journey's like Point's: through exploring the frontier and interacting with the Native Americans, Point and his compatriots brought the continent closer. Next week I'll be writing and possibly recording an audio accompaniment to the exhibition, and I look forward to articulating the images into a spoken narrative. The end goal of my internship is to organize all the drawings I cataloged for their inevitable exhibition at Loyola University's Museum of Art next summer, and this week I've begun that process. First, I reorganized all the drawings back into their original groups: religious and battle scenes, portraits, landscapes and a small miscellaneous section. They had become rather mixed up in the last few weeks of cataloging, and it took about an hour to complete this reorganization. After redividing all of the pictures, I began the long process of organizing the pictures for the exhibition. During a meeting with my adviser, I learned how they were going to be exhibited next summer. Along one large wall at LUMA, groups of four drawings will be grouped vertically with their titles, and there would be about twenty of these vertical groupings. As such, some of the drawings will have to be left out-a prospect that I greatly enjoyed considering that many of Point's drawings are nearly impossible to date or estimate where they were drawn. So this past week I began with the religious scenes, organizing them into groups of four I believe reflect their general thematic topics, subject matter or setting. The small story of Ignace's spiritual journey! This part of my internship is what I've been looking forward to most, and it was very enjoyable to construct small narratives through these pictures. One group of drawings tells a short narrative of the religious life of Ignace, a son of a noted Indian chief. The first piece shows Ignace's baptism by Father De Smet, followed by the "Prayer for Ignace on his deathbed," and ending with two pictures of Ignace's Last Rites and his funeral. As such, the future audience will be able to see one man-who has been dead for over 150 years- and his growth as a devout Christian. I can't wait to continue this process: creating over twenty short artistic narratives, all of which will be unveiled next summer at the LUMA! The next week I'm going to continue this process, and I hope to be finished by Wednesday. Come back then and hopefully I'll have a picture of the completed project: over eighty pictures all arranged into their respective groups! Stay tuned! Hello all! This week was mostly geared towards organizing the drawings I've cataloged and beginning to compile wall posts for them. I began the week by organizing all of the drawings, according to their respective themes, into two general piles: completed and uncompleted. As their names suggest, the first pile was made up of drawings/works that I felt very comfortable placing geographically and chronologically; the second pile was made up of still questionable pieces. The split was generally 60-40. The main problem running throughout the mass of drawings is two fold: one, many of the works are very vague, depicting general topics(such as a nondescript river or valley); and two, many of the them are therefore difficult to place in any geographic or chronological context. One drawing in particular is quite troubling: it depicts simply a man sleeping next to a wagon. Given his clothes I estimated that he was a Jesuit, an based solely around the fact that he was tired I assumed that it took place during the first major journey to the West. However, that second assumption is based pretty hugely on conjecture and, to a limited degree, educated guesswork. For the rest of the unknown drawings I guess I'll have to work more on drawing clues from their subject matters or themes, coupled with evidence from the texts to place them in the first, completed category. This next week is going to be pretty much focused on completing this final task of initial cataloging. I've been splitting my time between school, volunteering and the beginnings of a Master's Program, so I haven't been able to spend a lot of time on the tasks at hand. However, this coming week I'm going to be spending a lot of time on Point's drawings so I've given myself till the end of the week to complete the aforementioned task and begin writing wall texts for all of Point's drawings. Till then! p.s. Sorry about the oft-late postings, I've been particularly busy but starting this week I'll be spending a lot more time with the drawings than before. So expect my next post in a few days! 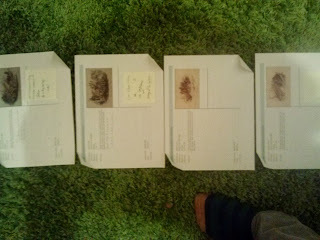 This week I continued to analyze the collection of drawings which are the center of this internship. While last week I looked primarily at religious scenes and landscapes, this week I am analyzing battle and hunting scenes drawn by Point between 1841-1847. Despite a difference in subject matters and themes, I ran into the same problems from last week during the last few days. Many of the drawings are somewhat difficult to place chronologically and/or geographically, and therefore the majority of my time was spent looking through the research materials for any clues. 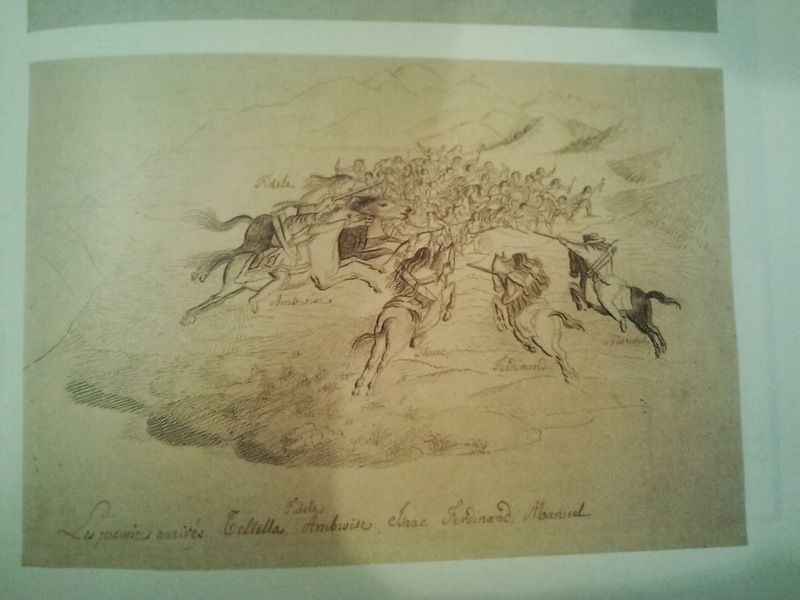 One perfect example is a drawing depicting a handful of Flatheads attacking a much larger Blackfeet force, with a note from a previous researcher referring to Sacred Encounters. After finding the Encounters page which offered only a small contextualization for the scene, I used clues from the excerpt-namely the fact that it was during a tale end of a winter hunt and the fact that the Flatheads were attacking a superior force-to find the scene within the biography of Nicholas Point. 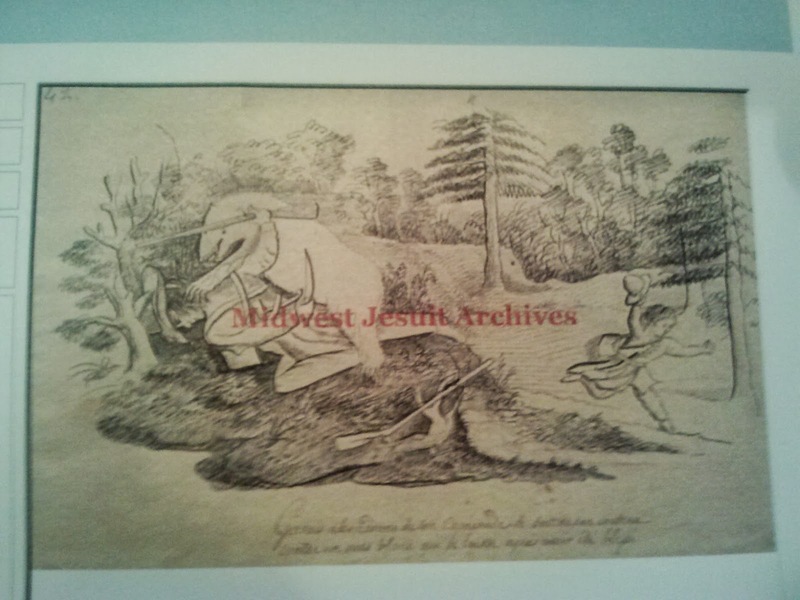 As such, I was able to pinpoint the piece as having been drawn sometime around March 1844 during the tale end of the Winter Hunt, as well as the reasons behind the attack and what happened afterwards. This task was repeated many times over, my research materials becoming littered with Post-it notes and many of the drawings being well documented in terms of when and where they were drawn. However, in many instances my investigation returned little in the way of clues or hints. For instance, many of the drawings depicted scenes of Native American warriors combating bears during hunting trips. The problem is that there are very few references to bears in any description of a hunting scene. One of the drawings show Gervais, the son of a well known Flathead chief, being attacked by a white bear during a hunting trip with the only indicator of time/place being the summertime foliage. Therefore, the next major hurdle is going to be closely scrutinizing each drawing that I've yet to place in the timeline so I can create a better chronological/geographic map of all of the drawings in each thematic section.